(Right: The little-known "seventh" Marx Brother, Photo, prepares to shoot the day's festivities.) It all began when parade founders, Clint Campbell and Mark Soifer, took a trip to nearby Pitman, New Jersey, to have a look at their DooDah. Campbell and Soifer wanted a DooDah of their own, but were hesitant, fearing they would appear to be coveting their neighbor's DooDah. But as luck would have it, the event was canceled in Pitman after the appearance of a semi-pornographic float, opening the door for Campbell and Soifer to lift the parade for Ocean City's use. 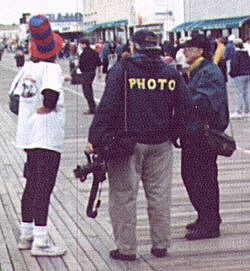 But while the Ocean City parade shares its name with it's predecessor in Pitman (as well as the original DooDah Parade in Pasadena, CA), most of the events surrounding the Ocean City parade are entirely original. 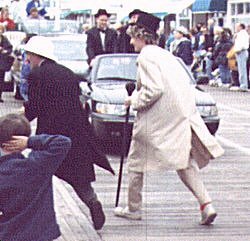 (Left: Groucho and Harpo beat a hasty retreat from the parade route as Laurel and Hardy approach in the background.) 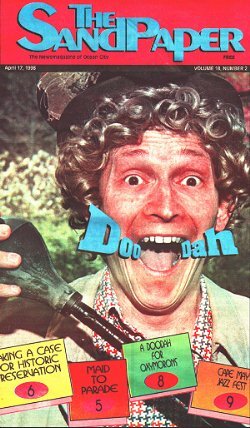 When Soifer first approached him with the idea, Campbell wanted to hold his DooDah on New Year's Day. This was impractical for obvious reasons, so it was suggested that the parade be held on the first Saturday after the income tax deadline, on which day it has been run ever since. 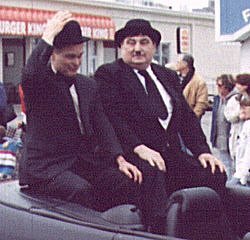 (Right: A couple of guys dressed up as Laurel and Hardy, earning them the honor of riding in the parade.) The parade's concept is a fairly simple one: Get a whole bunch of people together, dressed in outlandish costume and doing really weird things, and march them down the boardwalk. This fact was painfully obvious to me as I made my first visit to the parade this year. Parked near the reviewing stand, I saw all manner of celebrity impersonators, including W.C. Fields, Charlie McCarthy, Mae West, Abbott and Costello, Laurel and Hardy, Al Jolson, and even Sophie Tucker, pass by. And several local groups of performers also got into the spirit of the event, many donning "Groucho Glasses" for the occasion. 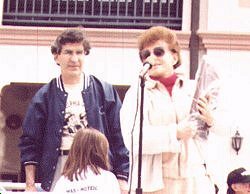 (Left: Miriam Marx Allen accepts a lifetime achievement award for her famous father (Groucho) and uncles from Ocean City DooDah co-founder, Mark Soifer.) But while weirdness has always been the order of the day for this event, it wasn't until 1993 that someone came up with the brilliant idea of using the parade to honor classic comedians. The Marx Brothers are the sixth to receive such an honor. Spike Jones, who was the first in 1993, was followed by Ernie Kovacs in 1994, The Honeymooners in 1995, Abbott and Costello in 1996, W.C. Fields in 1997, and finally the Marxes in 1998. 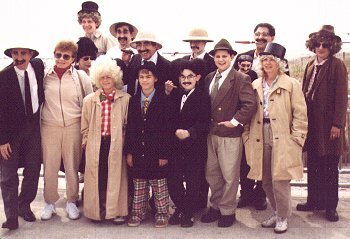 This year, Groucho's daughter, Miriam Marx Allen, was flown in from California to accept a lifetime achievement award for the team. (Right: W.C. Fields chats with Mae West as Charlie McCarthy sits on his lap.) And though classic comics are on everyone's mind during the weekend's festivities, many others are represented as well. This year's parade featured a local Elvis Presley impersonator (who was eerily good at his job) and Suzanne Muldowney, a notorious local "performer" who, dressed as Supergirl, received the cherished "Piece of the Walk" award for having the pluck and "sticking it out" for 10 years in Ocean City. 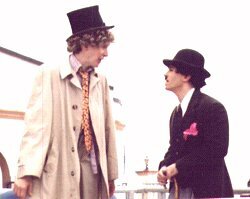 (Left: Two classic, silent comedians have a few words with each other on the reviewing stand after the parade.) The parade may seem to many to be a cheap, thinly-disguised attempt to promote off-season tourism in a Jersey Shore resort community, but it's obvious to all attending the weekend-long shindig that the parade's founders and all its participants are in this thing for the joy of it, not for what little money is involved. Local businesses help to foot the $8,000 bill by sponsoring the parade. And each registered marcher receives a free hotdog lunch and commemorative t-shirt from Dietz and Watson. At the end of the parade, representatives of various fan clubs set up on the Music Pier to hawk their wares. Paul Wesolowski was there this year, still dressed as Harpo, selling copies of The Freedonia Gazette and other merchandise, while Miriam Marx Allen was signing copies of her book, "Love, Groucho." W.C. Fields, Harold Lloyd, Buster Keaton, and others were also represented. 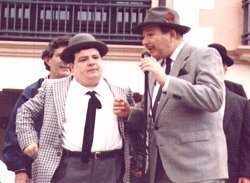 (Right: Abbott and Costello give the parade crowd a teaser for the afternoon's comedy show by performing a short excerpt from the classic bit, "Who's on First?") 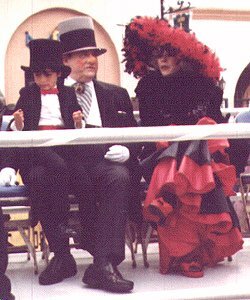 This year's festivities concluded with a comedy show on the Music Pier, featuring many of the celebrity impersonators who had appeared in the parade. The show was emceed by George Benson as W.C. Fields, and featured Bud Palmer and Lou Sciara as Abbott and Costello, Holly Ferris as Mae West and Carmen Miranda, and Ron MacCloskey filling in for Groucho. And while these impersonators were much more convincing to the eyes than the ears, the show was still entertaining (on several levels). The highlight of the show was Palmer and Sciara doing several classic Abbott and Costello routines; of all the acts, this was by far the most convincing. The day ended for many of us at the Port-O-Call Hotel restaurant, where several of the parade's participants and a few of us onlookers gathered for a "postmortem" dinner. The food wasn't great, but the entertainment was top-notch, as Paul Wesolowski showed us several unairable outtakes from Groucho's television quiz show, You Bet Your Life. To use a tired old phrase, a good time was had by all! With only a few noticeable exceptions, this proved to be a wonderfully entertaining weekend. And while Sunday was a washout due to inclement weather, we still had time to enjoy several boardwalk attractions after the parade was finished and went home content and happy and wishing for more. This may have been my first DooDah Parade, but it certainly won't be my last!